This form of corrosion will eat out the volutes and impellers of centrifugal pumps with ultrapure water as the fluid. It will eat valve seats. It will contribute to other forms of erosion corrosion, such as found in elbows and tees. Cavitation should be designed out by reducing hydrodynamic pressure gradients and designing to avoid pressure drops below the vapor pressure of the liquid and air ingress. The use of resilient coatings and cathodic protection can also be considered as supplementary control methods. Impingement attack is related to cavitation damage, and has been defined as ‘localized erosion-corrosion caused by turbulence or impinging flow.’ Entrained air bubbles tend to accelerate this action, as do suspended solids. 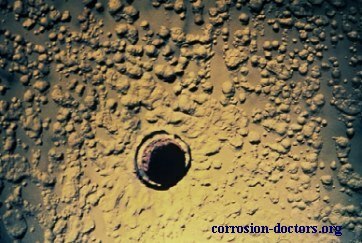 This type of corrosion occurs in pumps, valves, orifices, on `heat-exchanger tubes, and at elbows and tees in pipelines. Impingement corrosion usually produces a pattern of localized attack with directional features. The pits or grooves tend to be undercut on the side away from the source of flow, in the same way that a sandy river bank at a bend in the river is undercut by the oncoming water. When a liquid is flowing over a surface (e.g. in a pipe), there is usually a critical velocity below which impingement does not occur and above which it increases rapidly. Impingement attack first received attention due to the poor behavior of some copper alloys in seawater. In practice, impingement and cavitation may occur together, and the resulting damage can be the result of both. Impingement may damage a protective oxide film and cause corrosion, or it may mechanically wear away the surface film to produce a deep groove.